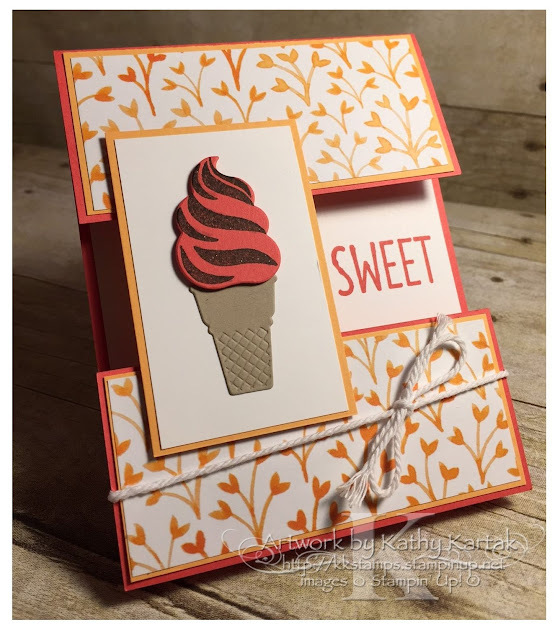 #stampinup #faithfulinkspirations Yes, I know it's the middle of winter, but I like ice cream any time of the year! My favorite ice cream is soft serve and I love to have a chocolate-vanilla swirl with rainbow sprinkles. Yummo! 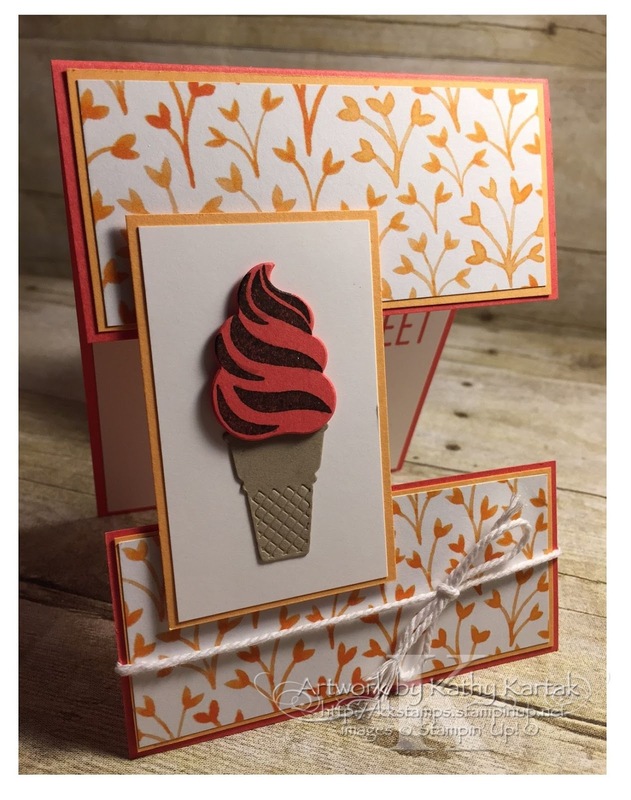 Today's card reminds me of my favorite ice cream treat--and I used one of my favorite card designs--a hinged card. When I first saw a hinged card, I thought it was going to be crazy hard to make, but it's really simple! The ice cream element holds the bottom of the card to the top of the card--it's like a bridge. Clever, huh? Here's how I made it. I started with a half sheet--cut lengthwise--of Watermelon Wonder Card Stock. I scored it in the middle--at 5-1/2"--just like I was making a regular card. Then I cut one side off at 2". That forms the hinge at the top of the card. I cut the leftover Watermelon Wonder so that I had a 2" by 4-1/4" piece. And I used the leftover from that to cut the ice cream using the Frozen Treats Framelits. I cut two 4" by 1-7/8" pieces of Peekaboo Peach Card Stock. I adhered one to the top hinge and one to the leftover Watermelon Wonder piece. I cut two 3-7/8" x 1-3/4" pieces of Fruit Stand Designer Series Paper and adhered these to the top hinge and to the Watermelon Wonder/Peekaboo Peach leftover piece. I tied a length of Thick Whisper White Baker's Twine around the leftover piece. Next, I cut a 4" by 5-1/4" piece of Whisper White Card Stock and adhered this to the inside of the card. I stamped the word "sweet" from the "Cool Treats" stamp set in Watermelon Wonder in the center, as close to the right side as I could get it. PRO TIP: Use your leftover piece for proper center placement of the sentiment. 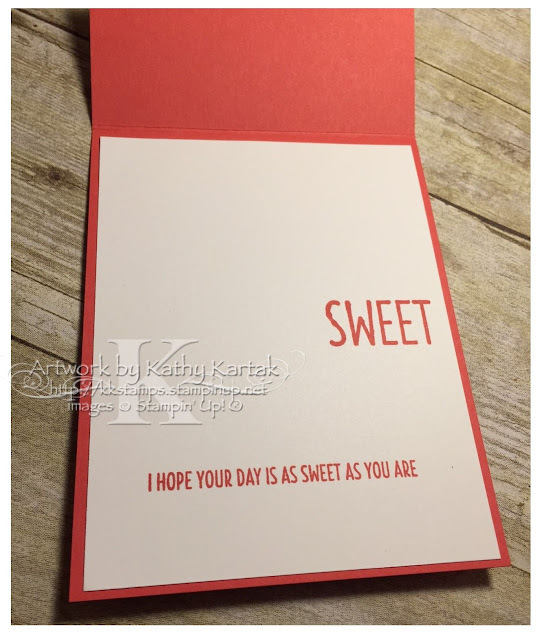 I added an extra sentiment that will be hidden when the card is closed. For the ice cream cone element that holds the card together, I started with a 2" by 3-1/4" piece of Peekaboo Peach and a 1-7/8" by 3-1/8" piece of Whisper White. I used Stampin' Dimensionals to adhere this to the top hinge of the card and to the formerly leftover piece--bridging the two elements of the card front. I stamped the Early Espresso swirl onto the Watermelon Wonder ice cream. I made a Crumb Cake cone using one of the Frozen Treats Framelits. 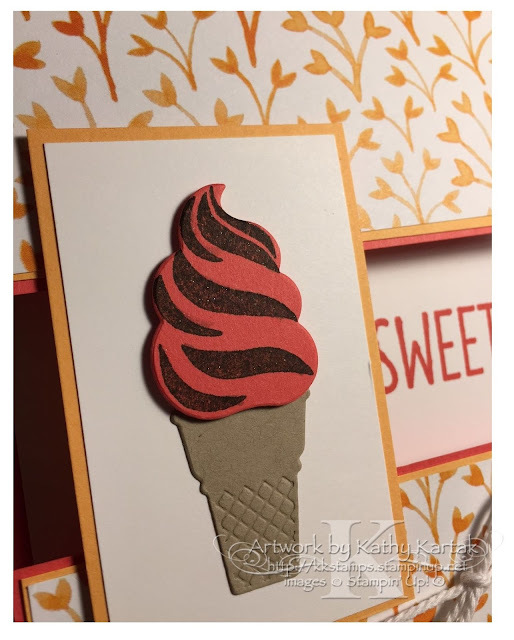 I adhered the cone directly to the panel and used Stampin' Dimensionals to add the ice cream. For a finishing touch, I added some Wink of Stella to the chocolate.